"TOP URGENT! 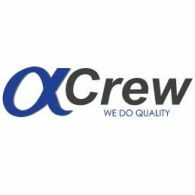 CE - Crew Boat - 160 - 180 USD p/d Rank: CE Vessel: Crew Boat Contract: 90 days Embarkation: end of April Salary: 160 - 180 USD p/d Region: Persian Gulf Requirements: - good English, - 2 years rank experience on same type of vessels with Cummins Engine. To apply for this position, please, follow this link: https://my.alphacrew.com/job/5535 email: cv@alphacrew.com Tel: +380482 37 19 57 ext 201"